Endocannabinoids are naturally occurring endogenous lipids (fatty acids) in the human and animal body that interact with the cannabinoid receptors in the endocannabinoid system. They are present in the body of all mammals, including cats and dogs, and the interaction between cannabinoids and receptors are similar to a lock and key effect (key going into a lock to unlock a door. In this case, unlock therapeutic function. Once these endocannabinoids interact with receptors, they create a cascade of effects in the body which can result in therapeutic effects such appetite, pain sensation, mood, memory, and mediating the psychoactive effects of cannabis. Because mammals produce these compounds naturally, they are more casually known as the body’s “own” cannabinoid system and it is involved in a variety of physiological processes, including appetite, pain sensation, mood, memory, and mediating the psychoactive effects of cannabis. The endocannabinoid system is different from person to person, which is why the discovery of this system is so important. Recent neuroscience research suggests that some people are born with a “bliss gene” that prevents one of the endocannabinoids present in the body, anandamide, from being broken down. Scientists have demonstrated that this genetic variation in the brain makes some less anxious. This genetic mutation produces higher levels of anandamide — the so-called bliss molecule and natural marijuana — in the brain. Scientists are still uncovering the mechanisms of action for all the endogenous cannabinoids in the body and at CannPal, we’re learning how to leverage this for use in animals. 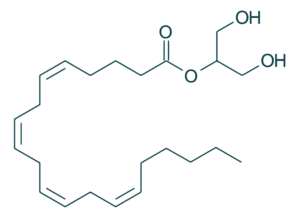 The first discovered and 2 best-characterized endocannabinoids are anandamide (arachidonoyl ethanolamide) and 2-arachidonoylglycerol (2-AG). Anandamide is a cannabinoid that is made by the body. The compound is named after the sanskrit word ananda, meaning bliss. 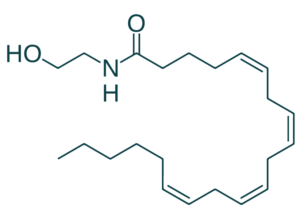 Anandamide is a cannabinoid neurotransmitter that is part of the endocannabinoid system. This biological system is wide-reaching throughout the body and brain, and it is responsible for many different effects. Anandamide binds to CB1 and CB2 receptors, and is also known to modulate TRPV-1 receptors (vanilloid receptors). CannPal Animal Therapeutics Limited (“CannPal”) is a pharmaceutical-focused animal health Company researching the benefits of medical cannabis for companion animals. The Company listed on the Australian Stock Exchange (ASX) in 2017, trading under the ASX ticker “CP1”. CannPal was founded to research, develop and commercialise, regulatory approved medicines derived from the medical cannabis plant to provide veterinarians with clinically validated and standardised therapeutics to treat animals in a safe and ethical way.